As a leading political website design firm and having worked with dozens of other niches, we understand that one of the most important and appealing aspects of a web presence is to gather important data about visitors. This data can be leveraged to keep in touch with visitors, microtarget your message, provide relevant calls to action, and more. From our experiences with clients and other industry research, we have seen that one of the most effective ways to quickly build a list is to prompt your visitors for data very early in the site experience. One way to effectively accomplish this goal is to have a registration splash page before the main content. A splash page significantly (30-50% in some cases) increases sign ups. However, while it is extremely beneficial to have as much data on each visitor as possible, it can be troublesome to try and collect it all at once. For splash pages, we don't recommend collecting more than 5 simple fields, typically: First Name, Last Name, Email Address, Cell Phone, Would You Like to Receive Texts? - only email and name are typically required of those fields. This strategy of collecting limited data upfront is due to the fact that people are much more likely to fill out a brief, simple form that only asks for basic information than to take the time to fill out detailed data. There are several reasons that people don't want to fill out too much information at once. First, is simply the time factor involved. Visitors to your site are busy people and have plenty of things to do other than fill out your form, so they're likely to abandon the process if there are too many fields. Second, is a trust factor. This visit could be the first time that the person has interfaced with your organization, and they could be hesitant to give out too much information about themselves. However, just because you only gather a little data early, it doesn't mean that you can't expand on that information over time. This is where the "often" of "gather data early and often" comes into play. Once you have a visitor's base information from your splash page, an email registration, a contact form, or some other form of contact, you should continue to ping them over time to fill out more data. A great strategy is when blasting out emails to supporters, to send different blasts to people with varying amounts of information in your database. For example, for folks that you only have a name and email for, prompt them at the end of the email to visit your site and enhance their file with more important information. By breaking the "data asks" into several chunks, you've avoided the first obstacle of a long form being a time-sink for visitors. They now never have to spend a substantial amount of time on a single form with an overwhelming number of fields. Similarly, you've jumped the second hurdle of trust by having established a rapport with the visitor over a series of email blasts and other interactions. They likely now either support the campaign or are willing to receive more information to help their decision, so as long as you haven't abused the original data they provided, they're more likely to fill out the second fields. The other half of the often equation is to have "data asks" laced throughout your site; in fact, there shouldn't be a single page that doesn't afford someone the ability to submit data, even if it's just an email address, or to quickly access a contact/volunteer page. 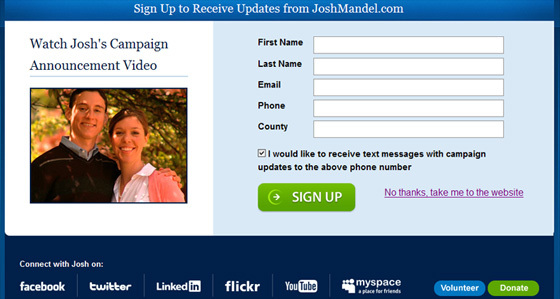 On our political sites, we have an email registration field as a standard feature in the top right of all pages. Furthermore, even on our own corporate site, every page has a newsletter signup in the sidebar. By prompting vistiors for information early and by understanding that you don't need to hit the ball out of the park on the first submission, you can reliably scale your contact list over time. Use frequent asks, email marketing, and sustained contact to continue gathering more and more information from visitors, ultimately allowing you to better microtarget your message and personalize thier experience with your organization.